During the cold weather, you want to guarantee your house stays warm and cozy. Keep in mind that the average heater life expectancy is about 15 years, after this, you may notice that your unit may require frequent heating repair or that it’s always breaking down. To prevent any of the costs that come with HVAC replacement, it’s important to recognize the warning signs that your unit may display. 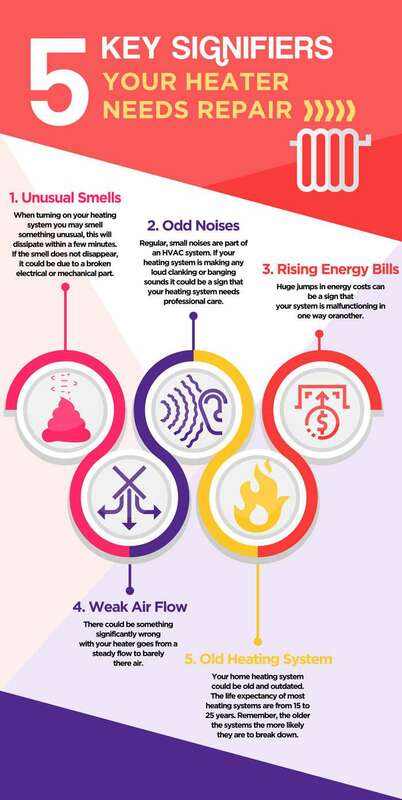 From weird noises to bizarre reasons why your heating unit is blowing cold air, a heating unit repair can make all the difference. Make sure you watch and listen for signs that your heating unit needs a tune-up, this will ensure that you maximize the life of your home heating.